AncestorPuzzles.com: Genealogists Beware of "Fake News"
Genealogists Beware of "Fake News"
Fake news is making headlines recently but journalistic inaccuracies are nothing new. 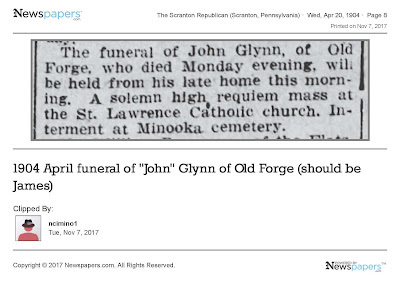 Genealogists searching for newspaper stories about elusive ancestors in the 19th and 20th century will need to be careful and search for additional evidence before jumping to an erroneous conclusion. 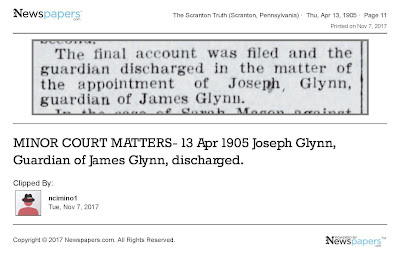 Here is one small case study involving the Glynn Family of Lackawanna County, Pennsylvania. James Glynn was born in January 1834 in Ireland. He immigrated to the U.S. about 1848. He married Bridget Dunn probably in New York in 1856. They had 15 children in 21 years in New York and Pennsylvania. 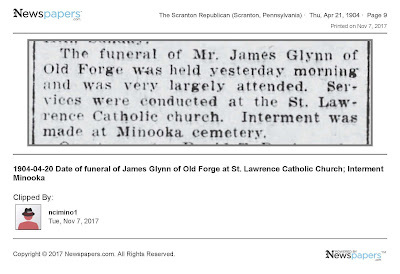 James Glynn and his family are found in census records in Old Forge, Pennsylvania, in 1880 and 1900. He died before 1910 given the fact that his wife was a widow in the 1910 census of Old Forge. Death certificates became required in Pennsylvania in 1906. Nothing was found in the Death Certificate database for James Glynn. He is also not found in any of the early death records of Lackawanna County. The next step was to look for an obituary in one of the nearby Scranton newspapers. 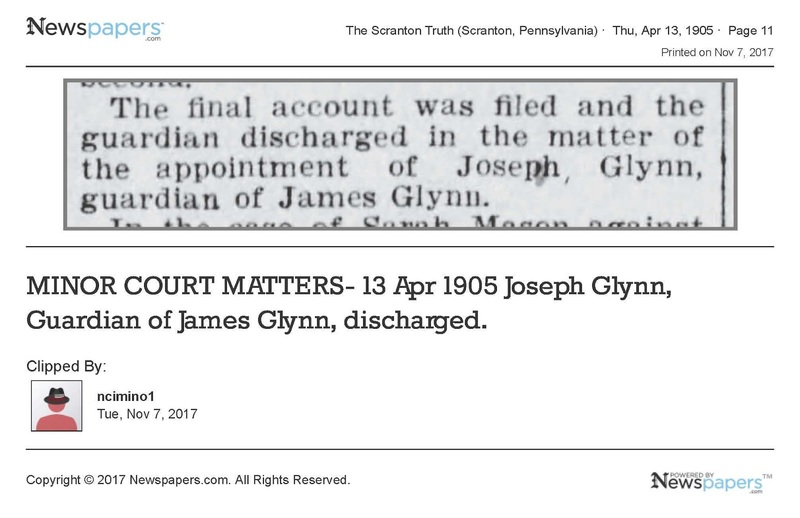 Chronicling America has digitized images of the Scranton Tribune from 1891-1910 but no obituary was found for James Glynn. Newspapers.com has several other Scranton newspapers in their collection including the Scranton Tribune (1894-1902), the Scranton Republican (1889-1936), the Scranton Truth (1904-1915) and a German language newspaper called the Scranton Wochenblatt (1869-1918). When you look carefully at these two articles, you will see that all of the details are the same except for the names John and James. 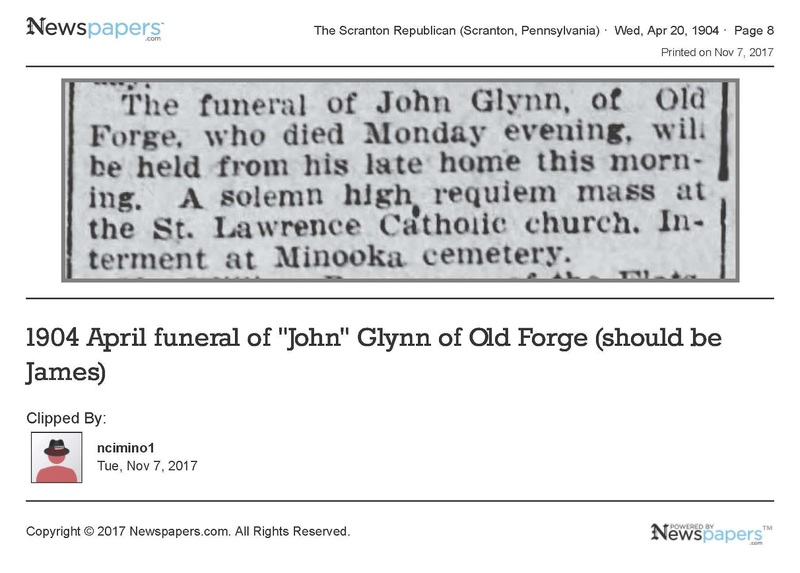 I believe that the first article was a misprint and that it should have stated James Glynn instead of John Glynn. Fortunately, there were two articles that allowed for comparison and analysis of the facts. 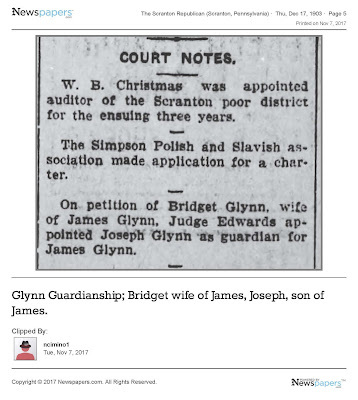 In addition two articles were found regarding a guardianship for James Glynn. 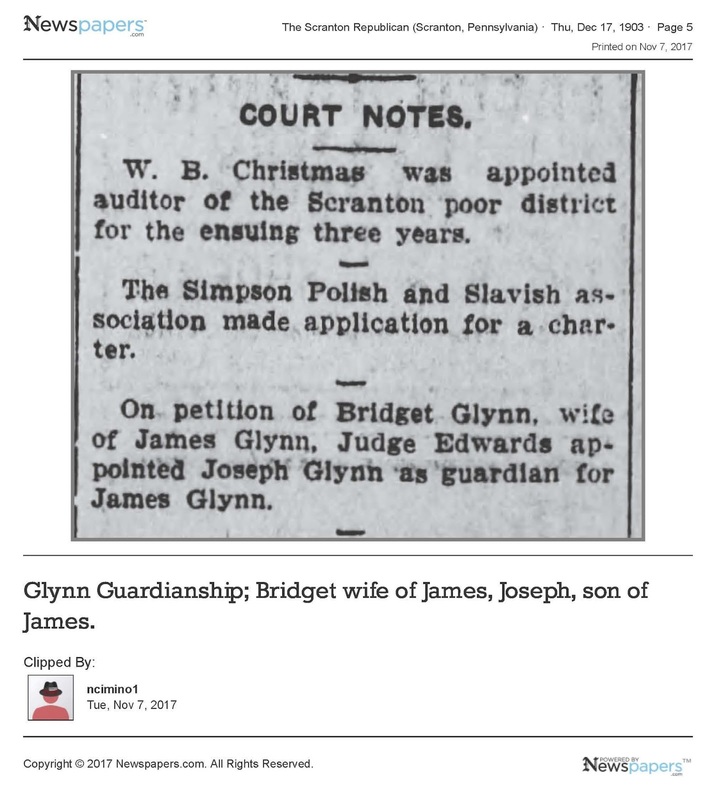 It appears that he may have become incapacitated and his wife, Bridget requested that her son, Joseph Glynn, be appointed guardian for his father. 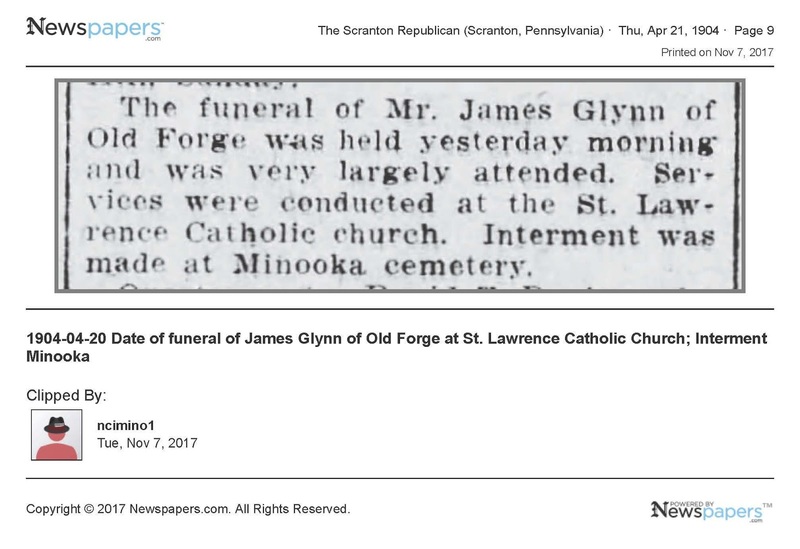 These additional facts concerning the guardianship of James Glynn help to accumulate a preponderance of genealogical evidence indicating that the death of James Glynn of Old Forge, Pennsylvania occurred on 18 April 1904.